Since all of my posts last week were devoted to Fashion Week, we missed our usual At the Movies day. But Auntie Mame works for both all of the creative fashion folks that made the week so much fun as well as all the decor mavens and those of us who straddle both worlds. Who doesn’t love this marvelous classic? “Life’s a banquet, and most suckers are starving to death.” Don’t those words just say it all? Based on the runaway bestseller by Patrick Dennis, the 1958 comedy is a movie of unrestrained visual glamour and perfectly scripted clever banter. Rosalind Russell stars, as she did on stage, as the free-spirited indefatigable society figure who becomes responsible for raising her brother’s 10 year old son, Patrick. This movie has everything – fabulous humor, heartwarming sentimentality, great costumes and sets, wonderful script by the accomplished team of Betty Comden and Adolph Green and biting social commentary (including my very own town)! Of course it’s Rosalind Russell who makes the movie. I just can’t imagine anyone else – EVER – as Mame. Russell embodies Mame’s devil may care attitude and adventurous bohemian spirit with the utmost perfection. Who else could possibly make all Mame’s crazy capers seem not only so utterly appealing but even plausible. There is also a wonderful supporting cast with Peggy Cass, Coral Browne and Forrest Tucker. 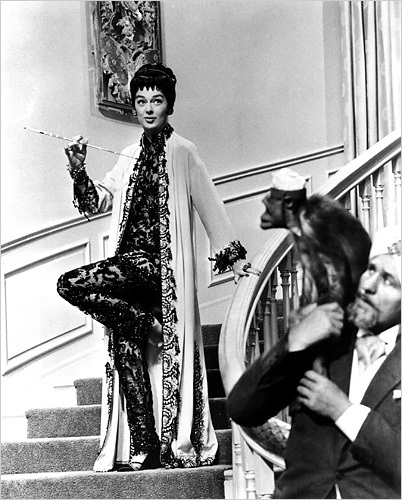 Mame’s numerous costume changes are matched only by her Beekman Avenueapartment’s frequent redesigns. From 1920’s urban glamour to chinoiserie chic, the sets will cause you to hit the pause button to take in every detail. If you are ever feeling down or stuck, this is the movie to pull out (or stream from Netflix). It will instantly lift your spirits. You’ll want to dress up, redecorate, travel and entertain! Russell’s Mame is the ultimate survivor. Her limitless lust for life is contagious and will inspire you to open your heart and mind! A favorite clip below, but if by some chance you’ve never seen, be aware – major spoiler alert! Enjoy!! This entry posted in film. 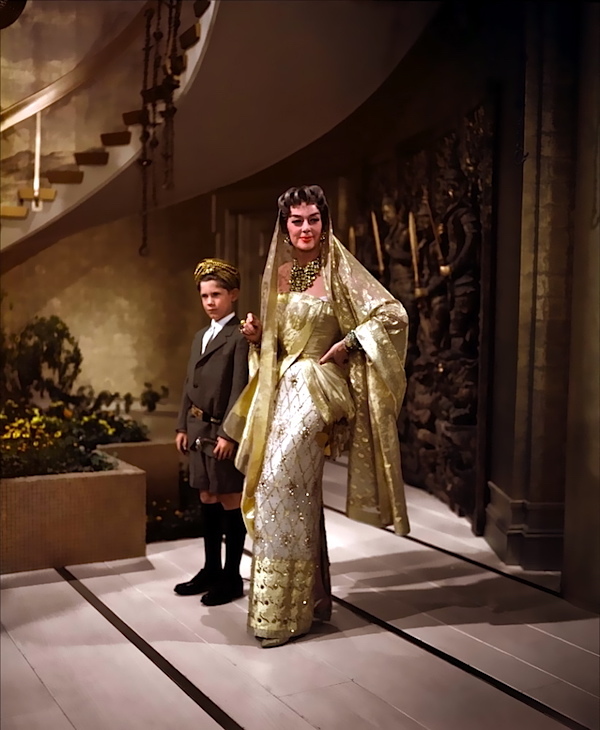 Entry Tags: Auntie Mame, Classic Movies, Movie classics, Rosalind Russell Bookmark the permalink. 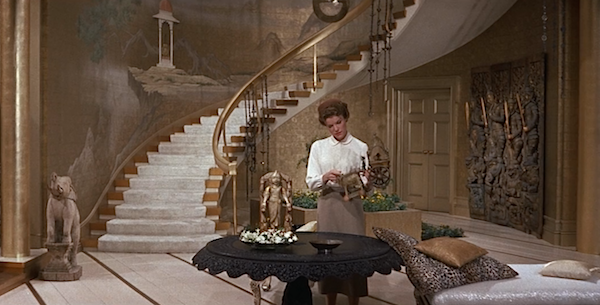 I love auntie mame — it is so good. Doesn’t she look like Annette Benning? Maybe she could star in a remake.. I did just as you said and saw “Mame” on Netflix. It was just what the doctor ordered for last night! As you said, I hope that NO ONE ever thinks they can remake this film. It is Fab..fini. There is a later version starring Lucille Ball. It’s different, like the scenes of Mame going down South to meet her fiance’s rich, stuck-up family and winning them over, but you might like that version, as well. I love the costumes! Talk about fabulous, they black lace jumpsuit is. I watched this for the first time last year and fell in love with her and her ever changing decor. How on earth have I never seen this movie???? How? Looks like I’ll be zipping over to Amazon (sadly no Netflix in my neck of the woods) but I will be happy to buy it as it seems like something to watch over and over again. As always your taste and recommendations are amazing! You’re so right. Mame is perfect in every way. Our family loves it at Christmas too! One I haven’t seen! I will see if I can find it. Have a wonderful weekend, q. One of my all time favourite movies which I have forgottom how many times I have seen! It continues to delight over and over again. 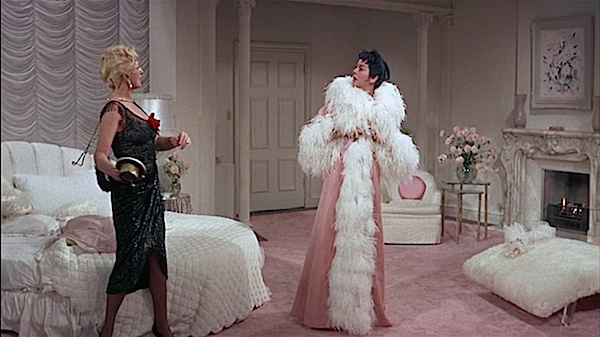 Mame’s costume and interior changes are all to die for and as you say worth hitting the pause button over. There was another remake done with Lucille Ball as Mame which although not as good, has its merits. One of the merits in the remake is that Bea Arthur plays the role of Vera Charles, and it is worth seeing for her performance alone! I love this series you do! !Another movie I’m adding to my list. Now I just need free time to watch them all! I think I now know what movie my husband and I will be watching tonight…Happy Friday!! As much as I love Lucy, her version is often cringe-inducing. But Roz pulled off the role beautifully. As for the interiors, I used to plead to the TV as a child “That is great, don’t change it!”. Oh, I haven’t watched this since I was a girl– must remedy that! Such a happy film. Thanks for the reminder! 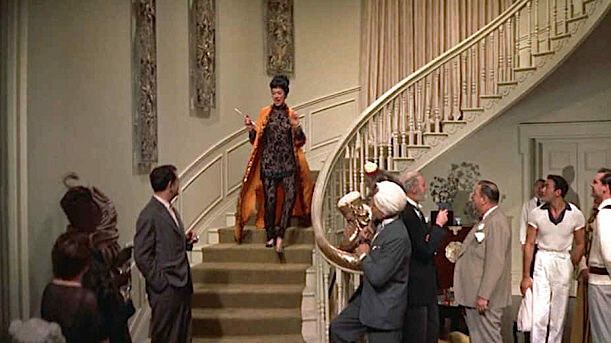 I have had a lifelong aspiration to be Auntie Mame. She rises to every challenge with zest and success and I want that apartment – in any incarnation. Thank you for reminding me about this wonderful movie – and that it is a netflix streaming. You made such a great choice, like so many others, I love this movie! I remember seeing this movie as a child on a Saturday morning then again as an adult – two very different experiences. “When you’re from Pittsburgh you have to do something” made me laugh out loud. I’ve never thought of it before but while watching the clip I was kind of reminded of Allison Janney just a little, in looks mostly. Now that I’m sending “How to Steal a Million” back to Netflix, I’ll have to add this one to my queue – it’s been ages since I’ve seen this classic and sand along with the songs! Happy weekend, Q! I have always loved this movie and haven’t watched for years!! 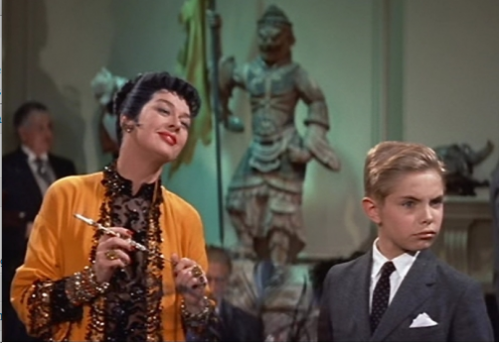 I adore Auntie Mame!! And actually I could use a little bit of her spirit and motivation right now, might be time to see it again this weekend. Great review and details of this movie…I ‘ve never seen the whole thing from beginning to end…crazy I know!!! The set decoration is so brilliant. Don’t you wish you could have been in on all the decisions…or at least along for the ride! In the video clip you provided, I couldn’t help noticing the floating shelves…staggered no less on the wall…it’s hard to believe people think that is such a new and modern idea …from Pottery Barn! I love this feature that you do, on the old classic films. I am inspired to see them all. Thanks for the beautiful posts on these movies. And I agree with you, who wouldn’t want to be inspired by Auntie Mame’s zest for life! I bought this on DVD at Christmas. It sounds SO up my street. And those sets!! I think I might have to make it our Sunday movie this weekend. Rosalind Russel is so fab! And those white apartments + spiral staircase–breathtaking! This will be on my weekend pleasures list if I get a chance to watch a movie. Hope you have a wonderful weekend! Brilliantly written!!! You have convinced a girl who never watches old movies, to watch this flick asap. I know I am a tad embarrassed to admit, but I just don’t gravitate to older movies. I rarely even watch new ones and TV forget it. Can’t wait to watch this one though! Thanks so much for sharing! I love old movies..dont think I have seen this one but I can see the flavor of the movie in your pictures and have a feeling I would enjoy it….will have to check it out. I have been in a “old movies” state of mind lately, watched Gone with the wind and Love Story this week..nothing like the classics!! What a marvelous movie. Do you think it would be possible to have a re-make? It seems to me that’s just the type of film we need now — sophisticated banter; a soupçon of good, common sense delivered with wit and oh the clothes, the decor. . .
Who today could be Mame? I have never seen the movie, but would love to, as I’ve heard so many references to Mame…I would like to know what’s all about. Tonight we are “in”….so hoping we’ll get to watch a movie in front of a fire. THE BEST MOVIE! 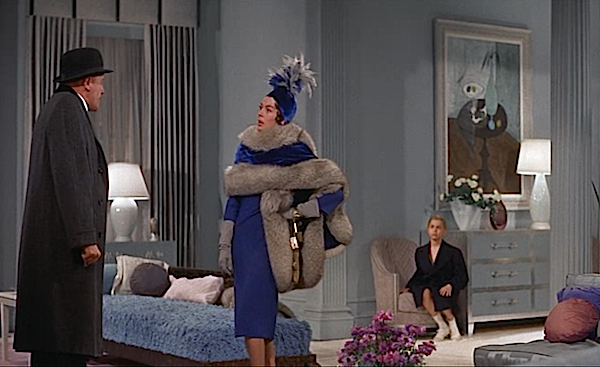 I think that Auntie Mame was the real reason why I became an interior designer and set dresser. Everything about that classic is glam and fabulous! Oh how unbelievably glamorous is that first lace fringe coat?! I have always loved this movie and your reviews are just wonderful. I could just hole up in my pajamas and watch movies by the fire for an entire weekend. Never leave the house. Doesn’t that sound just wonderful? I am live blogging with the team at womensvoicesforchange.org tonight and just took a break to catch up on my favorite blogs in between the idle banter and tiresome Oscar Night. They didn’t make any like Mame this year. Love your Movie Days. 86 queries in 1.079 seconds.